Thank you for doing such a superlative job in the preparation in advance of the appointment, the execution of the inspection and in the written report. All was done in a timely and very professional manner. We found it very helpful to receive a verbal summary on site which highlighted the salient aspects of your inspection. And, we found your written report to be very detailed, comprehensive and extensive. It greatly assisted us in asking the vendor pertinent questions regarding the property. We would have no hesitation in referring your services. Rose Low and David Greenall. Thank you Rick for your thoroughness and time spent reviewing our home on Bowen Island. Looks like we have some work to do with both our places. Luckily our Bowen home is our retirement home and the location and size will allow us time to relax while tinkering away. Deep Cove will be the monster to tackle over the next year. But we feel confident we can renovate this house so it will be safe for re-occupancy. We have been left with a sense of ease knowing what we are getting into. Buying a home is one of the most expensive transactions you will do and spending money without awareness of what you are buying, can be a painful outcome. No one buys a vehicle without having it completely checked out, why would you buy a home without all the checks and balances. 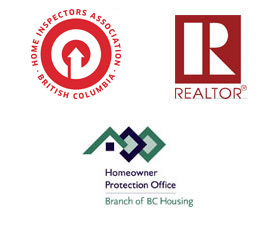 Our home inspections have been done with integrity, diligence and experience. You came highly recommended and we will also recommend your services to any of our friends or colleagues who will be purchasing homes. It was a pleasure working with Buchamer Home Inspection Services. Rick provided a service above and beyond our expectations. His willingness to share his knowledge and experience was much appreciated. We would not hesitate to recommend his services to anyone. We’re more than happy to recommended you to other home buyers; your advice is high quality and your “after sales service” exceeds expectations. Small world!! Is the original house still there? We were very happy with the whole inspection process and the manner in which it was conducted by Rick. Really insightful and professional. In fact so happy that we decided to buy the condo and hoping to close in the next couple of weeks. I did want to comment on your services that were provided to my client on Jan 2, 2013 @ #20 - 220 E 11th N. Van. Rick was a Champ. Knowledgeable, courteous, efficient and a pleasure to be around. He didn't rank on how good he was or how many inspections he did. The inspection wasn't about him, it was about the inspection. I've been doing my job close to 18 yrs and have been through quite a few inspections.The clients were very happy with his inspection and how he presented himself. His work was very well done. I will put him on my "nice" list and not on the "Do not call" list. Thank you for your follow up. Subject was removed and sale is final. Professional , thorough, courteous, detailed. Enough said. Rick: I wanted to write and let you know I thought your inspection yesterday was truly exemplary. I have been involved in two previous inspections and nether came close to the level in professionalism and thoroughness of yours. Both Sara and I enjoyed your insights and real interest in the inspection process and the house itself. The experience for us was educational and of great value to our family. We will never again look to another inspector, as Buchamer Inspection Services is our one and only stop. I want to express my gratitude to Rick because he helped us to make a final decision about the house recently inspected. He is very professional and has a great attitude towards any issues that might come up during the inspection. Keep it up that way. Thank you for the follow up! We were extremely pleased with our inspection. It was explained to us carefully and thoughtfully. Both my husband and myself found Rick to be very personable and patient with our questions. We would not hesitate to use your company again also we will pass along a good word to friends. My clients were extremely satisfied with your service and really enjoyed meeting Rick. Due to the inspection we were able to negotiate $6500 price reduction. I will definitely recommend in the future. This is the second time in a month that Rick did a property inspection for us and, as with the previous time, it was a very valuable and enjoyable experience for us. Rick is thoroughly professional and an all-around good guy. We learned a lot and came away feeling very confident about the property we have just purchased. We did end up buying the house - the deal just went through last night in fact. We've come to an agreement about this abestos removal, so that was resolved amicably enough. I really appreciate the thoroughness of the inspection and Rick's willingness to help fill in all the gaps of my basic knowledge of this stuff. It really help settle our minds about the house. Everything went great and I was very impressed with how everything was done. I will recommend Rick to anybody I know that is in need of a home inspection. Thanks for the follow up. My client was very happy with the inspection report, which was excellent as always. Hope to do tons more business with you in the New Year. I was very impressed with Rick's inspection. He was very helpful, ubpeat, thorough, and was very happy to include us in the process. I liked that he explained the WHYs of the things he was writing down, not just the WHATS. This led me to understand what was important and what the concequences would be. His inspection was extremely valuable. I would use him again and have already recommended him to a friend. To whom it may concern, For the record I would just like to express my thanks to Rick for his outstanding presentation on the condition of our new home to be. Not only is he a gentlemen but he also exhibited a non-intimidating professional and truthful presentation. My mind was fully at ease with Rick. It’s clear that this company’s best interest is YOUR interest. I would most certainly recommend Rick to anyone. As first time home buyers we really appreciated Rick's candor, professionalism and thoroughness as an inspector. We'd recommend Buchamer Inspection Services to anyone as a good investment and one of the best things to do when buying a home. The first home inspection Rick provided likely saved us hundreds of thousands of dollars by uncovering many hidden issues at a house that we didn't end up buying... and at the second home inspection Rick helped us to find our true dream home as well as providing a reference binder of specific information that will help us to understand and maintain the value of our home! Thank you for all your help Rick! We wanted to take a moment and let you know how pleased we were with your inspection services. Sue and I have been involved in many inspections over the years, and your services were head and shoulders above them all. Keep up the great work!! Rick you provided us with a very professional and detailed inspection. We really appreciated that we were able to participate in the inspection process, it was extremely informative. We would like to share with you how much we value your services. Your level of professionalism and communication were outstanding. You allowed us to feel secure in our decision to buy the home. Kathy and I would like to thank you for doing such a great job at our inspection in Richmond. Your reporting system is a valuable document in allowing us to understand the maintenance and repairs needed to protect our investment. Rick, you performed a great inspection for me last week, I would not hesitate to recommend you to anyone looking for a good inspector. By the way we were able to recieve a discount on the pruchase price, due to the fact that you indentified the roof was nearing the end of it's life. Knowledgeable, courteous, efficient and a pleasure to be around. Details of the Recommendation: "I've known Rick for many years as he has performed numerous property inspections for my clients when they are buying or selling a home. He has always done a great job of identifying any issues and explaining them in a calm and understandable manner. When it came time to purchase a home for myself, I hired Rick because I knew he would look out for me. He has even helped my parents with their fight over an improper roofing job, with his expert opinion proving to be valuable in the roofing company admitting they did not do the correct work.